Picture the scene, you and your stout comrades from Gauth are fighting through the grim caves of grimdarkness when you stumble upon something that brings a quiver of pure joy to your black dwarven heart. A suit of most excellent enchanted platemail that should provide you with all the protection you will ever require against the grimdarklings. But alas, when you don the fullplate you discover to your immense displeasure that you look like you're wearing a pair of dingo's kidneys to the summer ball in elftown. Now this wont do, you need a way to turn that fullplate into the true doomplate you deserve. You open the toolset with enthusiasm and become mired in a quagmire the likes of which has never before been experienced by dwarfkind. Well fear not, young adventurer, for this guide will carry you through the swampland step by step. There are several rules we ask you follow when submitting a recraft, some of these points may be unclear to you when you first read this guide, however by the end hopefully all will be clear. These rules are primarily in place to ensure that DMs can swiftly and easily process your recraft and spend more of their in-game time creating roleplay encounters for everyone to enjoy. Only one recraft request per month. Per player. More than one item per request is OK, so long as all are contained in the same .ERF file. Recrafted items must use the correct Classification and have an easily identifiable name. Recrafted items must use sensible appearances and colours. Test your item in your test module first before submitting. Trust us. Store bought items can not be recrafted. The KOTOR armour appearence is currently restricted to NPC only. Sorry. Please do not use this appearence as your recraft will be denied. Please Note: If you recraft an item with Sockets you will not be able to add further enchantments to the item. Make certain you have completely enchanted your item before submitting it for a recraft. Open the toolset from the Neverwinter Nights 2 autorun menu. 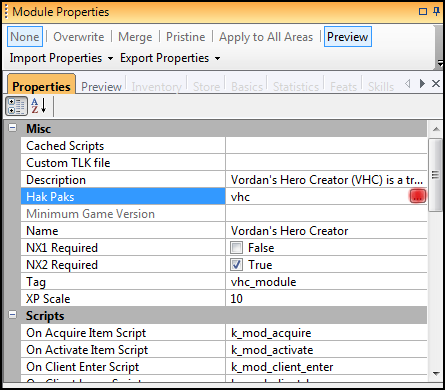 Navigate to File -> Open and load Vordan's Hero Creator. 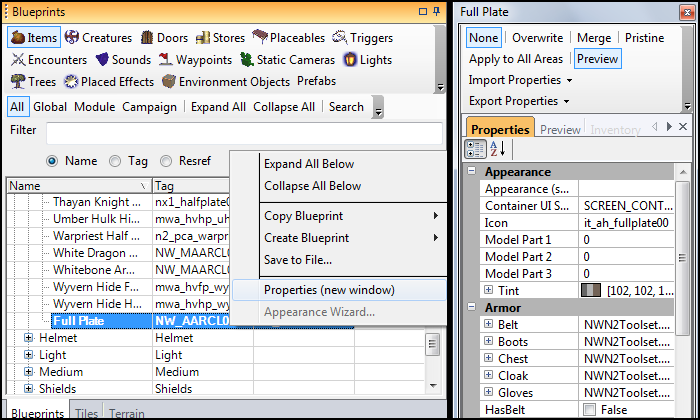 Navigate to View -> Module Properties. You should now be able to locate a window on the right of the toolset that looks like the image below. Click Hak Paks and then the small button which I have highlighted in red on the image. 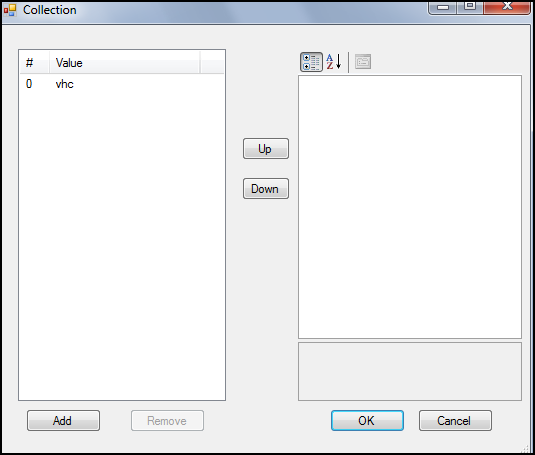 A window with a list should appear that looks like the image below. Remove the vhc Hak Pak and then proceed to use the add option to load all of the Hakpaks associated with Depths of Norhaven. When you are finished you should have a list that looks like the one on the image below. Above the field on Module Properties you should see a field called Custom TLK File. In this field write don.tlk. You should now have a new version of Vordan's Hero Creator with Depths of Norhaven's Haks loaded. Whenever you wish to make a recraft, you can use this module and be certain to have access to the unique armour, clothing and weapon appearances we use for the module. Now that you have prepared your Test Module, you will need to prepare the Blueprint for your recraft. This stage is important as during it you will make sure the properties of your recrafted item match the item you have in-game. It will also ensure that when the DM is searching for your items in their own test module they will be able to find them easily. Look to the bottom right of your toolset window. You should see an area for Blueprints that looks like the image below. Click on Items to navigate to the items tab. You will see a list of categories much like the image above. Navigate through these categories to find the blueprint that most closely resembles the item you want to recraft. If you want to recraft plain fullplate, for example, find the blueprint for fullplate. When you have found the blueprint you want to use as your base. Right click on it in the list and navigate to Copy Blueprint -> Module. If you scroll down the list for that category you should now find a new fullplate blueprint at the bottom that has been bolded. Right click on this new blueprint and navigate to Properties (new window). You should see a window like the one to the right of the image above appear. You will want to re-size this window to a reasonable size so that you can work with it. The first thing we will set for your item is the Icon. Click on this option under appearances and open the drop down list, from here you can select the icon that will appear for your recrafted item in your inventory. It's time to set up some basic information for our blueprint. We will be referring to the image above for the next few steps. Lets begin with the Classification field. Here you will set what category the item appears under when the DM processing your recraft spawns it to his avatar. Click on the area highlighted in red and set it to Recraft. Please note, this must be set to Recraft, otherwise the DM will not be able to find your item! Next, we move on to the area highlighted in blue. This is the description your item will have when right-click examined in-game. Feel free to write a short history for the item or leave it blank should you prefer. Finally, we need to set the Resource Name, Tag and Template Resref. For these please use your Username followed by your Character Name and a general term that describes the item itself. Note that it should be the same for each field. Once you have filled out those fields you should have something that looks like the image below. Now we need to set the Base Type of our item. Use the field highlighted in red on the image below. Make certain this matches up with the item you are looking to recraft. Finally, we need to set up the Item Properties. You can do this by clicking on the button highlighted in blue on the image above. Again, you must make certain the properties of your recrafted item match up with those of the item you have in-game. No +10 Fullplates of Badassery. We will be checking! You now have your Blueprint fully set up and ready to go. This is usually the meat and bones of any recraft request, If you get this information right you will be making the DM who processes your recraft very happy. Unfortunately if any of this information is set up incorrectly it introduces further difficulties, so it's worthwhile to check and double check this information. If you have made it this far you will be relieved to know that you have reached the fun part of this tutorial. In this section of the guide I will be showing you how to set up the custom appearance of your item. Remember our golden rule that the armour or weapon must be sensible in terms of appearance and colour and be certain to check the item in your test module before submitting it. We will divide this into two sections since setting the appearance of armour is somewhat different from weapons and shields. For weapons and shields we will be using the above image as a reference. First we must change the Model of our weapon and shield. For this, use the Model Part categories. For weapons each category changes a different part of the weapon. For shields, only one category is used. Keep moving back between the Properties tab highlighted in that image in orange and the Preview tab which will allow you to preview how the weapon or shield will look in-game. When you have a model that you are happy with, you can move on to the Tint section. Here you can use Colour 1, 2, and 3 to change the colour of your weapon or shield. As with when you were setting the model type, feel free to move back and forth between the Preview and Properties tab until you are satisfied with the item's appearance. For armour we will be using the above image as reference. 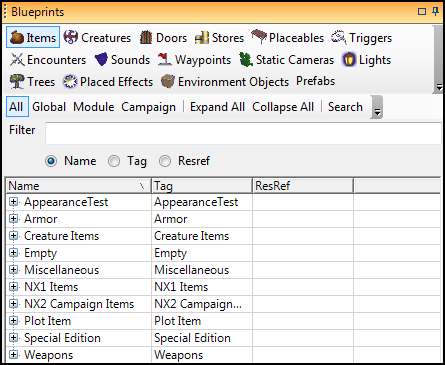 You will notice along the top edge of the Item Properties window there is a tab known as Armour Set. If you navigate to this tab you should see a window much like the one above, with a preview image to the left. First, we need to set the Main Type. Using this drop-down menu you can move between the various armour groups, then select which appearance within the group you want to use in the drop down menu below it. You will notice that the preview to the left changes as you change the options, giving you a good idea of how your armour will look. If you want to see the armour on a female model, scroll all the way down to the bottom of this window and check the box that says Show as Female. Having set the Main Type we can now introduce the options for tinting. You will notice that every option for your armour's appearance has three boxes to it's right, these are used to tint various pieces of that armour component. Start by clicking the boxes to the right of Main Type and changing the tints of the base section of your armour until you have a colour theme you're happy with. Now that you are familiar with the basic concepts, we can move on to work with the rest of the armour. You will notice the area highlighted in green contains a long list of components, each with their own tint options. You can use these options to customise the various parts of your armour. Remember to keep checking the preview image to the left to make sure you have an overall appearance you're happy with. You should now have your item in your character's inventory. From here you can put it on and walk around in your test module to see whether the item looks as you expected in-game. Always be certain to do this as items will look somewhat different from how they look in the toolset and it is always worth it to double check so you can make adjustments as needed. Now that you are completely satisfied with your item you can export it from the toolset by using File -> Export. You should be able to select ItemBlueprints from the drop down list and then locate your item on the list and select it for export. If you have multiple items, make sure you add them all before exporting. You should now be able to save a .ERF file somewhere on your computer, be certain to name it something recognisable such as your username and character name. Once you have exported your item as a .ERF file you can add that file to a zip folder and submit your recraft as a Helpdest Ticket. Be certain to have your character name and the word 'Recraft' in the title of your ticket. From there any one of the DMs can access your recraft and deliver it to you in-game, please be patient, as DMs have to take time away from their usual schedule. That being said, we will do our best to get your recraft to you as soon as possible. Once you have received it in-game, make sure to check back and close your Helpdesk Ticket so that we can keep track of which recrafts have been processed. Congratulations, you now know everything you need to know. Feel free to use our Helpdesk to submit any questions you may have. As a note: including spaces in the tags and resrefs for your items makes them a pain to spawn and makes me a sad, sad man. Please use a happy underscore instead of spaces. Thanks! A personal request from me seeing I am doing most of the recrafts now. In the classification for the items can you please write the following. It helps me sort and find items quicker. There is only an 83% chance of blood showers for the event today.